There are many things that no-one tells you before you have children and find it out for yourself. Ask any mother and she will have at least one thing that surprised her! Your obsession starts with wondering whether you are weeing more than normal, as this could be an early indication you are pregnant. Then you have to make sure it's the right time of day to wee on a stick. Have you weed on it properly? It is actually impossible to wee on a stick the size of a cotton bud. It would be so much easier for guys - aim and shoot. Why is it that we, whose lives are changed so much by weeing on a stick, have a much harder time of aiming for the wretched thing?! Ok, so you think you're pregnant. Now you need to find a suitable container to take some of your wee to the doctors/midwife in. This will be the first of many times you will be asked to present your healthcare provider with a lovely bottle full of wee. Everytime you visit your midwife, consultant, doctor etc for anything pregnancy related they will want a sample of wee. What they expect to find in it I never worked out. Even if you gave a sample the day before then they want one again the next day 'because something might have changed'! Yes, I was actually told this at the hospital. By my third pregnancy I just turned up with a bottle whenever I went. You can imagine how unimpressed I was when they managed to lose it! I wonder what they did with the stuff? Maybe the NHS has found a new way to create energy from wee? Or maybe they just turn it into that stuff they call orange juice that you get in those silly cartons at breakfast? Anyway, I digress! Then you have scans and you now have to not wee (I wish the NHS would make its mind up) but instead sit in a waiting room for an hour after your appointment with a steadily swelling bladder while the lady who came in half an hour after you did gets called in for her scan. If you ask how much longer you're going to have to wait then the receptionist suggests you go to the toilet and let a little bit out. Have you ever tried to let a little bit out when you have had crossed legs for 2 hours? It's impossible! By the time you are nearly at term then you don't want to go anywhere without knowing where the nearest toilet is. 7lb baby sitting on your bladder means it doesn't hold very much. Once you've had the baby you may think you have been reprieved from this wee obsession but oh no! If you've had stitches then it HURTS!!! to wee so you think very carefully before approaching the toilet. As you become accustomed to motherhood you now move from obsessing over your own wee to that of your childs. Has she done enough nappies? Should it be that colour? Was that blood? Then as you move onto potty training there is the sheer and utter delight you feel at a teaspoon of wee in the bottom of the potty - hurrah my child has done his first wee in a potty! You tell everyone, friends, family, strangers 'my baby weed on the potty'! For some reason you think that everyone else will share your fascination and obsession with wee! Along with potty training comes an obsession with knowing where the nearest toilets are. You don't want to be caught short! And then of course you have to check they've been before they go anywhere! I was sent a Meet the Bumblejums book and CD to review. It was written by Des Shanahan and illustrated by Mike Collins and Oliver Akuin. The Bumblejums are a family of 4 characters who look out for the world they live in. They live together, work together and of course play music together! Jem, Jon, Jay and Jo - each with special powers, help those around them make a brand new day and a brand new way. Despite all of their environmental, planet saving activity, they have time to write and play their tunes! All work and no play is not the Bumblejum way! My children are 4 and 2 and I could barely get the book out of the envelope before they whipped it off me! The book is lovely and bright and really appeals to small children. The characters are easily recogniseable and help the children to learn more about the environment. This initial book is basically an introduction to the characters. We meet them and find out what they do, we learn about their house and how they spend the day. Nothing really happens but I think there will be more of a story in more books to follow. As a parent I loved the fact that each page has a short rhyme - no long prose. I love reading rhymes to my children, somehow its softer and more calming. Each page had lovely pictures and my 2 year old was quickly identifying each character. I look forward to reading more of these books with my children. The only downside about the book is that it is stapled together which means the pages can be (and have been!) quite easily pulled out. I feel a slightly stronger design is needed for young children, particularly mine, the Destroyers of Books! The CD had very folksy music - it reminded me of something from the 70s. In fact one of the songs did sound like Rolf Harris! But again it was very calming music, it wouldn't excite the children but they could listen and sing along to it. 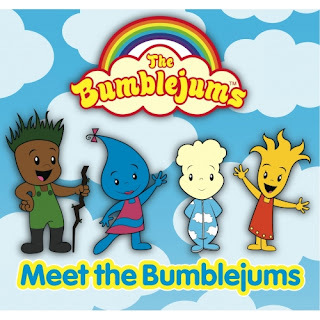 You can find out more about the Bumblejums at the Bumblejums website. The website has a link to their blog with fun Ecotips and also their store where you can purchase the book and CD. The book is available for £5.99 and the CD for £6.99 although it does state that the music is available on MP3 from Amazon and iTunes. The book and CD were given to me for the purpose of this review but the views expressed in it are my own. I think this is something most mums can relate to. One minute you're staring at a little blue line on a stick in disbelief - next thing you're pushing a melon out of your wotsit - before you can turn around you're packing them off to school! I can still remember the day I found out I was pregnant with the Girl. I'd waited 7 days after Aunt Fanny was due, followed the instructions, did the test, waited and... there it was. I was going to be a mummy!!! Today I received a letter saying she had been accepted into the primary school of our choice. When that little line appeared I never even thought of having to pick schools and uniforms. Two weeks ago I had to put my moses basket away for Bug. Although she's only 4 months now, she was really too big for it (none of my kids are small) and she's now in a cot. All those vests and babygros I had lovingly washed and put away while expecting her have now been put aside for another baby (not mine, 3 is enough!). Even her 3-6 months clothes are snug on her. And it makes me sad. With Girl, I always knew I'd have more. With Boy, it was unlikely that there would be more but there was always the possibility. With Bug, I know that my baby days are over. I have decided that my family is complete and I just cannot go through pregnancy again. We have our hands full with 3 under 5 as it is! So every milestone with Bug is the end of an era and makes me sad. No more newborn clothes. No more moses basket. It won't seem long before it's no more cot, and I'm packing her off to school. Everytime she reaches a new stage obviously I'm delighted but sad as she grows and develops. And therein lies the paradox of being a mother. You want them to grow and develop - you would worry if they didn't. But at the same time you want them to stay that tiny baby that is so new and precious. It makes me sad. I want to cry. And I know that this will happen again and again. I think more so than the other 2 because this is the last time for me. So I try to stay positive and look ahead. But inside I'm crying for my baby. What's this?! I can't believe it!! You had a glass of wine?! You couldn't take the pain! Drugs aren't needed in the main. Don't you know that breast is best? Why didn't you feed from the breast? If you're in such a dither! What is that I see? A jar??!! Is the only way to go!! Every day, and every night. Pestering you to do what's right. I am the perfect mother! That questions everything you do. Because, my dear, I'm you! And I am not the perfect mother! Captcha - How I Hate You! Firstly, let me say that I understand your purpose. You are there to make sure blogs and competitions don't get over run by spam. I understand that. I appreciate that. I am even grateful. However I do have some criticisms. Lately you have been behaving rather oddly. Not only could a bot not read you - I can't read you! Firstly, the words, they aren't words. They're just random letters put together to look like a word. Secondly, your hand writing. Lately it has been simply appalling. Look, I know you have to write on several thousand (if not million) websites a day and have to constantly rewrite for us idiots who can't read the first code, but still, show some integrity please! When all the letters are jumbled up against each other how on earth am I supposed to work out what that word says? So, slow down, write a little clearer and then you won't have to do all those re-writes! Simples! By the way, I'm not some illiterate, I used to be a secretary and my boss's hand writing could be used for some sort of code because only I could decipher it. I always said if I could decipher his hand writing I could decipher anyones - you, however, have the first writing to stump me. Even me, yes me, has to click on the little button at the side of the code sometimes because I just cannot make head nor tail of your writing! PS: please be kind to anybody who tries to comment on this post!! We're potty training Boy at the minute. Which means that most of our conversations revolve around wees and poos. It has caused some hilarity tho. The other day we had a discussion about whether poo came out of his bum or his willy (nobody ever prepares you for these conversations when you are about to become a mum!). And then we have to go through lists of things. Boy: We don't eat poo do we? Me: No, we don't eat poo. Boy: And we don't eat elephant poo do we? Me: (Where is this coming from?) No we don't eat elephant poo. Boy: And we don't eat cow poo do we? Me: (Giggling by now) No, we don't eat cow poo either. That's just some of the silly conversations we've had lately. At a friends house they heard the song 'Head, Shoulders, Knees and Toes' but they heard it wrong so in our house its 'Head, Shoulders, Cheese on Toast'! They're hard work but bless them they have me in stitches so much!